Awhile back I discovered an undocumented flag called "esxvm" in the SQL statements of the new vCloud Director 1.5 installer that suggested the possibility of deploying nested ESXi hosts in vCD. 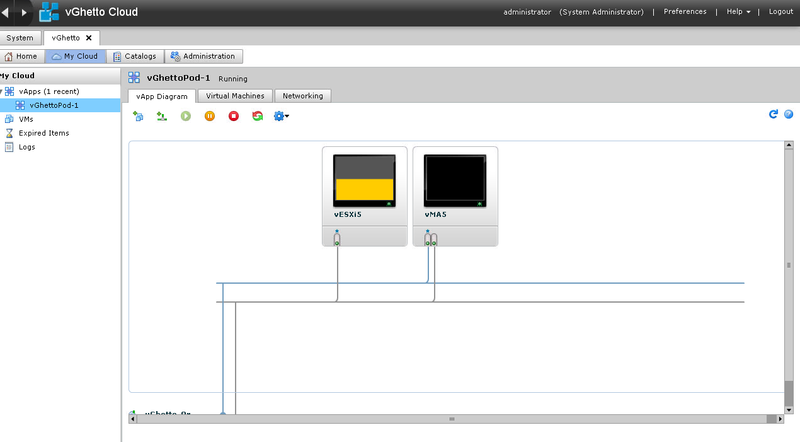 However, after further investigation the flag only enables the automated deployment of an ESXi 5 parameter (vhv.allow) which is required to run nested ESXi 4.x/5.x hosts as part of preparing a new ESXi 5 hosts in vCloud Director. There was still a missing piece to the puzzle to enable this functionality within vCloud Director user interface. Note: I will assume the reader has a good understanding of how to install/configure vCloud Director and how it works. I will not be going into any details in configuring or installing vCD, you can find plenty of resources on the web including here, here, here and here. I will also assume you understand how to configure vCD-NI and VLAN-backed network pools in vCloud Director and how they work. To apply these SQL statements to your vCloud Director 1.5 database, you will need to login to either to your Oracle or SQL Server database and manually execute these statements using the account that you originally created. 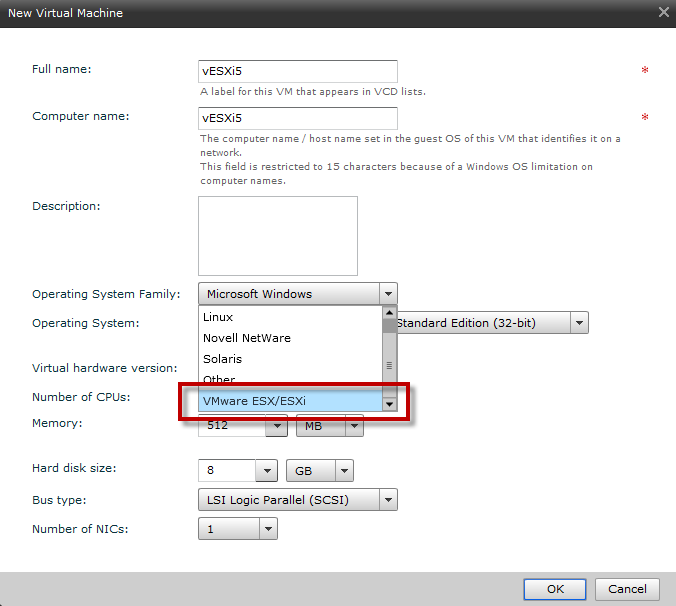 As you can see, we need we first create a new guest_osfamily type called "VMware ESX/ESXi" and we need to also provide a unique family_id, which from a default installation of vCloud Director 1.5, the next available value will be 6. Next, we need to create the two new guestos_type "ESXi 4.x" and "ESXi 5.x" and again we need to provide a unique guestos_id which from a default installation of vCloud Director 1.5, the next available values will be 81 and 82. If any errors are thrown regarding a constraint being violated, then the ids may already have been used, you can always query to see what the next value is or select a new id. Once you have executed the SQL statements, you will need to restart the vCloud Director Cell for the changes to take effect and if you already have prepared ESXi 5 hosts, you will need to re-prepare the hosts. If you prefer not to manually do this, you can take a look at my blog post Automating vCloud Director 1.5 & Oracle DB Installation which has been updated to allow you to enable ESX_VM mode with your vCloud Director 1.5 installation. There is a new flag in the vcd.rsp file called ENABLE_NESTED_ESX which can be toggled to true/false which will automatically perform the SQL statements as part of the post-installation of vCloud Director 1.5 and restart the vCD Cell for you. Finally, the last configuration tweak is to enable both promiscuous mode and forged transmit in either your vCD-NI or VLAN-backed Network Pool which is a requirement to run nested ESXi hosts. You locate the name of your network pool to identify distributed portgroup. Next you can either use the vCD API or login to your vCenter Server and enable the promiscuous mode for that specific distributed portgroup. We are finally done with all the configurations! 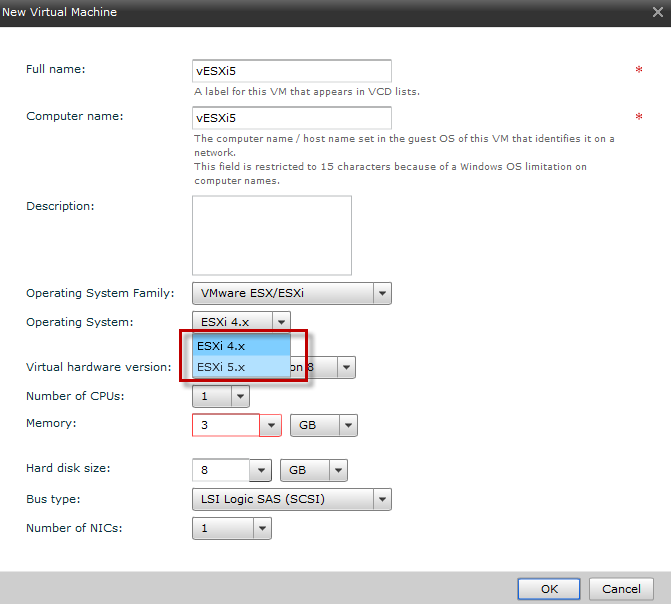 If you successfully completed the above, when you go and create a new virtual machine in vCloud Director, you should now have a new Operation System Family called "VMware ESX/ESXi"
Here is an example of my own vGhettoPod which includes vMA5 and vESXi 5 host which I can use to perform various types of testing in my home lab. 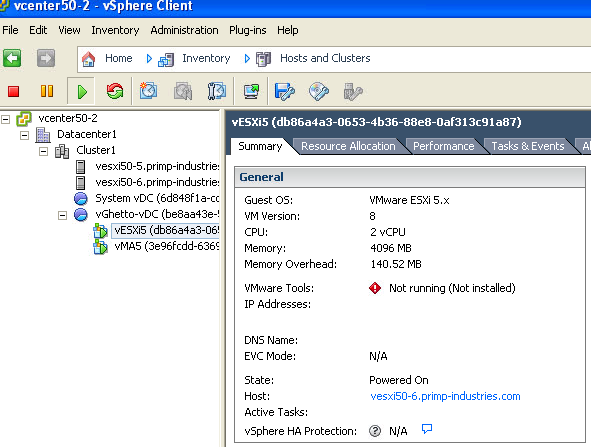 Now you can create your own ghetto vSEL cloud using VMware vSphere 5, vCloud Director 1.5 and vShield 5! Cannot insert explicit value for identity column in table ‘guest_os_type’ when IDENTITY_INSERT is set to OFF. 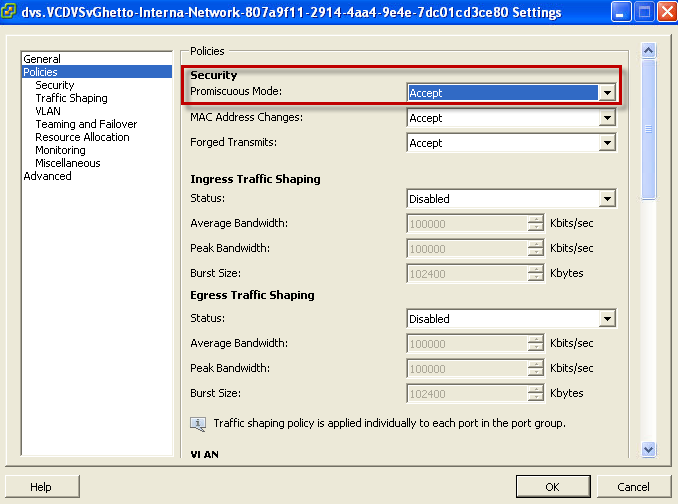 You can also set the Network Pool so that all portgroup’s that get created are automatically set to promiscuous mode. Note that this affects ALL portgroups created in the pool. The SQL query is not applicable for VXLAN networks as the management of the VXLAN NP is controlled by the vCNS. I’ll look at updating this information as it requires a slightly separate step. if i’ll use a vlan backed NP than the SQL update qeury is applicable. but…i dont want to use vlan’s so…is it possible to create a blocking task that will change the vlan ID to none after that the vApp portgroup creation ? Just what we needed. 🙂 But we are seeing another “issues” with Nested ESXi hosts. Pinging from the VMKernel on vESXi out through the vSwitch on the vESXi causes a dup response. If i ping another vESXi on the same host and net, it’ll create a 4x response of the package. We are seeing this on 2 seperate vCloud Installations. This is expected if you have prom mode enabled, you will see duplicate packets. Hi guys! On my vDS MAC Address Change/Forged Transmit is also rejected by default. These also need to be enabled to run a nested lab. 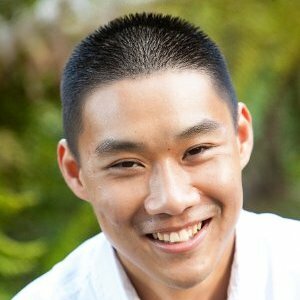 This guy is also reporting on this: http://grokee.com/nested-networking-woes-solved/. Of course you can manually change it, but a database tweak would be better. Cannot find a “mac address change” or “forged transmit” field in DB. Any suggestions? I’m not much of a SQL guy so any help or advice would be greatly appreciated. Thanks! Check out the results of this SQL query on the vCloud Director v5.5.1 database. Version 4, 5 and 6, yes I said 6 !! I found that this is added by default with vCloud 5.5 so if you upgrade from 5.1 to 5.5 and have made this change you will have duplicate entries in the guest_os_type table. Remove the duplicates and everything goes back to working as expected. I made all the necessary changes, however the GUI does not reflect the changes exactly. I now see the VMware radio button, however when I select it, the OS drop-down is populated with all the values that were originally in the “Other” category of OS Family. When I select the Other radio button, the OS drop-down is empty. No where do I see the VMware ESXi as an OS. I looked at the database and made sure that the new family_id was unique and corresponded to the correct guestOS. Why does your vCloud Director interface look different than mine? Are you using Air? I’m using 5.5.3 and the interface looks different.